Happy Thanksgiving to our US users! On the long weekend that accompanies the Thanksgiving celebrations, hiking and walking are great ways to spend quality time together (and walk off all that food)! We’ve put together some of our top tips for a hassle-free Thanksgiving, as well as a selection of easy to medium routes for you to enjoy with your loved ones, so all ages and abilities can join in. Plus get 15% off whole-country premium maps (including US maps) this weekend only in our Black Friday sale! Shop here. Thanksgiving is one of the busiest times of year to travel. Flying on the actual day of Thanksgiving and Black Friday may save you time and money, as they’re reportedly the least busy days. Find more travel tips for the holidays here! Figure out which recipes can be made in advance and create a timetable, so your kitchen isn’t chaotic while you prep the food. If you’re hosting for the first time, don’t turn down help! Let others bring dishes to make your life a bit easier. Every little helps! Check out www.thanksgivingtips.com/ for loads of how-to videos and recipes for unusual dishes. Most importantly: relax and have fun! Thanksgiving is all about being grateful and spending time with your loved ones, so cherish the moment. 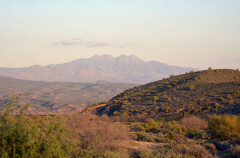 McDowell Mountain Regional Park covers more than 21,000 acres of desert wilderness at the base of the McDowell Mountains. Take the easy Scenic Trail to a hilltop to enjoy expansive views of surrounding mountains and plains. 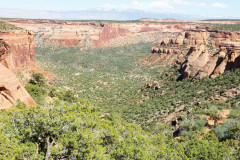 This descent through Monument Canyon winds through the eponymous chasm at the heart of the Colorado National Monument, leading you to spectacular views. 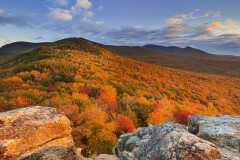 Fall is the perfect time to visit, rewarding visitors with prime temperatures, stunning colors and plenty of solitude. Park in the visitor's centre car park and follow the trail along the Grand Canyon South rim. Get there in time for sunset and you’ll see some beautiful views. This route takes you to the 'village' and back and is wheelchair-friendly. A bit of advice: pack a jumper for the evening as it gets chilly! Interlaken Boulevard is one of the Olmsted plan's promenades through the city. In the 1890s, it was part of a bicycle-path network that crossed Seattle. 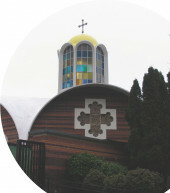 It remains a great place to retreat from the big city and commune with the big trees. Interlaken lets you pretend you're out in a deep wilderness, without the wasteful fuel consumption of a real country road trip. Powers Island is a 1.5-mile loop trail located near Sandy Springs, Georgia, which features the Chattahoochee River. The trail is good for all skill levels and offers several activity options for everyone to enjoy. This route takes you to the summit of Mt. Chocorua with beautiful views – the perfect trail for a family outing. You could also combine the Liberty Trail with the Brook Trail to make an excellent day hike loop. This beautiful looped route takes you through the heart of Pisgah National Forest. Following the trail, you eventually stumble upon a clearing with a beautiful small grotto where you find the hidden waterfall (you’ll be able to hear it first!). 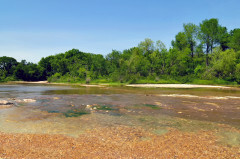 The Onion Creek Trail is located on the south end of McKinney Falls State Park. It’s an easy trail for most hikers and you’ll be able to see plenty of wildlife activity, from plants to animals, including lizards and deer.